Since I don’t have any pictures or anything yet, I will start this blog by speaking of my crafty history. When I was but a wee Stitchy, my mother loved to knit and crochet. She tells me about the beautiful coats and sweaters she made for herself when she was single, but what I remember are all the afghans. We always had plenty to go around - we rolled around on them, used them as capes, and made forts out of them. I remember my brother and I trudging home from school on cold days and being greeted at the door with afghans fresh out of the dryer. There’s nothing better than being wrapped in a huge pile of warm yarn after a miserable walk – even if it is acrylic. And so began my love of handcrafted stuff. I say "stuff" because I didn’t learn to crochet or knit until way later. My first obsession was embroidery, which my mother also enjoyed. My specialty was cute little animals. I even did a raccoon with a huge fluffy tail – which required a fair bit of technique for a kid. I recently found a few of my masterpieces, and much to my husband’s dismay, hung them. I did finally get the hang of it and branched out into filet crochet, a more delicate type of work using thin cotton. 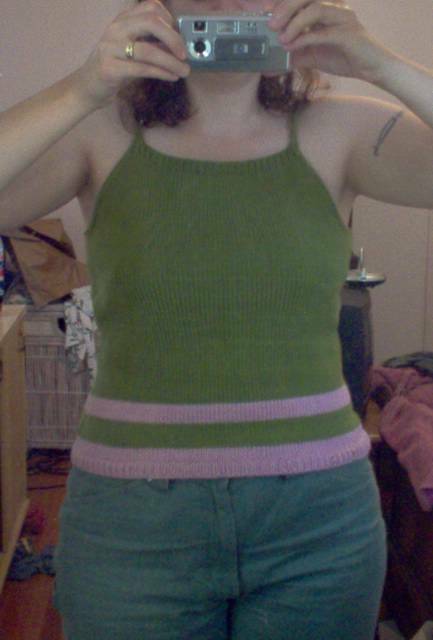 But the clothes you can make using crochet left me ice cold (and usually laughing). I just didn’t like the look of it. So after making countless afghans and doilies and lacey trim, I’ve moved on to knitting! I still dabble in embroidery and crochet, but knitting is really where it’s at. I’ve made many scarves, a couple of felted handbags, and just completed my first wearble thing – a ChicKami from ChicKnits! "Monopoly house earings? Oooo.. you won't happen to have a picture of those, would you? :)"
Not yet, bet there will be! I just have to get the camera working. drat! Love the weed afghan! I would have left it, LOL.